Frankfort Regional Medical Center receives several local, state, and national awards and honors annually which reflect the hospital's dedication to excellent healthcare and service. To find out more, browse through the awards below earned by our caring, highly qualified team of healthcare professionals and staff. Frankfort Regional Medical Center has attained Magnet® recognition for the second time, the nation's highest recognition in nursing excellence from the American Nurses Credentialing Center (ANCC). Only six other hospitals in Kentucky and 7% nationwide have achieved Magnet distinction. Magnet recognition, which hospitals must reapply for every four years, has become the gold standard for nursing excellence. The recognition is based on adherence to Magnet concepts and demonstrated improvement in patient care and quality. U.S. News & World Report’s annual showcase of “America’s Best Hospitals” includes Magnet recognition in its ranking criteria for quality of inpatient care. Get more information on the The Magnet Recognition Program® or AACN. Frankfort Regional Medical Center received full Chest Pain Center with Primary Percutaneous Coronary Intervention (PCI) Accreditation from the Society of Cardiovascular Patient Care (SCPC) on November 24, 2015. SCPC's CPC Accreditation process ensures that hospitals meet or exceed an array of stringent criteria and undergo a comprehensive onsite review by a team of accreditation review specialists. Hospitals that receive SCPC CPC Accreditation status have achieved a higher level of expertise in dealing with patients who present with symptoms of a heart attack. Get more information on SCPC's accreditation and certification. Frankfort Regional Medical Center has earned The Joint Commission’s Gold Seal of Approval® and the American Heart Association/American Stroke Association’s Heart-Check mark for Advanced Certification for Primary Stroke Centers. The Gold Seal of Approval® and the Heart-Check mark represent symbols of quality from their respective organizations. Frankfort Regional Medical Center underwent a rigorous onsite review. Joint Commission experts evaluated compliance with stroke-related standards and requirements, including program management, the delivery of clinical care and performance improvement. Get more information on Advanced Certification for Primary Stroke Centers. Frankfort Regional Medical Center has been verified as a Level III Trauma Center by the Verification Review Committee (VRC), an ad hoc committee of the Committee on Trauma (COT) of the American College of Surgeons (ACS). This achievement recognizes the hospital's dedication to providing optimal care for injured patients. As a Level III Trauma Center, Frankfort Regional Medical Center meets the essential criteria as a trauma center capable of 24-hour emergency, operative and critical care. The hospital provides prompt assessment, resuscitation, emergency surgery and stabilization of trauma victims. This heightened level of care is provided by having trauma surgeons on call and trauma trained staff available all the time to diagnose and treat patients. Get more information on trauma programs verified by the American College of Surgeons. Frankfort Regional Medical Center's cancer program was granted a three-year approval by the American College of Surgeons Commission on Cancer (CoC) Program. Considered to be the gold standard for cancer programs, accreditation by the CoC means patients can be assured they will receive high quality patient-centered care. CoC Approval is received by only one in four hospitals that treat cancer patients and is given only to those facilities that have voluntarily committed to provide the best in diagnosis and treatment of cancer. Get more information on the CoC. 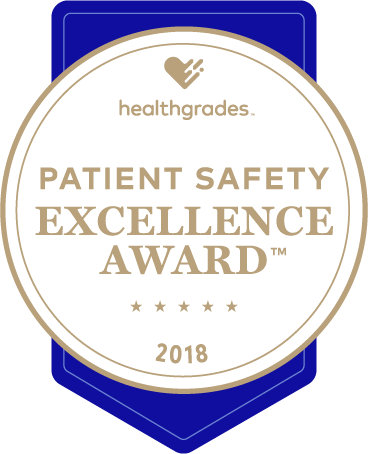 Frankfort Regional Medical Center is a recipient of the Healthgrades 2018 Patient Safety Excellence Award™, a designation that recognizes superior performance in hospitals that have prevented the occurrence of serious, potentially avoidable complications for patients during hospital stays. The distinction places Frankfort Regional Medical Center among the top 10% of all short-term acute care hospitals reporting patient safety data for its excellent performance as evaluated by Healthgrades, the leading online resource for comprehensive information about physicians and hospitals. Get more information about Healthgrades or download a full copy of the report. Frankfort Regional Medical Center is proud to acknowledge our hospital staff, physicians and administration for achieving the maximum three-year accreditation awarded by The Joint Commission during their 2017 survey of the hospital. The Joint Commission evaluates the quality and safety of care delivered in over 17,000 health care organizations across the country, and their standards are regarded as the most rigorous in the industry. Frankfort Regional Medical Center demonstrated full compliance with all of the 2017 National Patient Safety Goals. The hospital's success in passing the survey means we offer our patients exceptional quality care across a broad range of inpatient and outpatient services. It also means that we're on track with our mission to meet the healthcare needs of our community. Get information concerning a public notice for The Joint Commission survey. Frankfort Regional Medical Center has been named as one of the Best Places to Work in Kentucky for 2019 - making the recognition the 13th consecutive for the hospital. The Kentucky Chamber of Commerce, the Kentucky Society for Human Resource Management, and Lifestyle Health Plans recently announced the 100 companies that made the 15th Annual Best Places to Work in Kentucky list. The Best Places to Work in Kentucky initiative is based on FORTUNE magazine's "100 Best Companies to Work for in America" list. According to the Bureau of Labor Statistics, Kentucky has more than 17,000 privately-owned establishments with 20 or more employees. The goal of Best Places to Work in Kentucky is to raise the bar among the state's employers and create excellence and employee satisfaction in the workplace that will attract talented people for years to come. Get more information about the Best Places to Work in Kentucky.